Playa de las Americas, Tenerife - Photo: Gabriel A. As they are home to some of the best resorts in Europe, Canary Islands holidays are extremely appealing making it easy to understand why thousands of British holidaymakers flock there every year. Have a look at five of the best resorts and see which one tempts you the most. Playa de las Americas is the premier beach resort in Tenerife and boasts everything you could possibly want for one of those perfect holidays away. The beaches in the 16km coastal stretch are home to golden Saharan sand and shimmering clear blue water. As you might expect there are countless water sports on offer such as diving, snorkelling and jet-skiing and even the chance to get out at sea gazing at the dolphins and whales. Playa de las Americas is also home to some of the best nightlife in the Canaries, along the famous Veronica’s Strip – so don’t forget your dancing shoes! 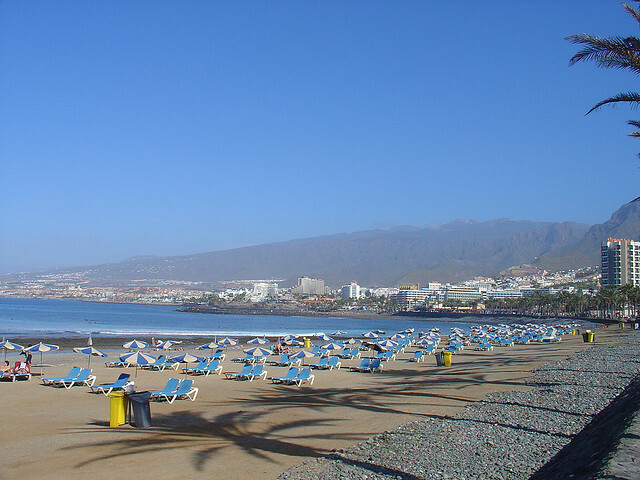 Puerto del Carmen is the longest established and for many the most well known resort in Lanzarote. It has everything holidaymakers require such as beachfront arcades, accommodation to suit all budgets and even casinos. The main beach has everything you could possibly need and the nightlife is especially vibrant. For those making the trip to Gran Canaria, the sumptuous coastline in the resort area of Puerto Rico is not to be missed. Two main beaches, covered in golden Saharan sand, split by imposing cliffs, are the perfect place to while away the days in the sunshine working on the tan, whereas if you’re feeling a little adventurous the cliff walk between the beaches provides the most picturesque view of the coast. This resort lies at the northern end of Sotavento – for many the best beach in Fuerteventura – so it’s clear what the main attraction is. The long white sand beach stretches out as far as the eye can see. This may not be the most ideal spot for those looking to go out clubbing every night, but it’s certainly the perfect location for a quiet beach holiday. The attraction of the zoo at the nearby Oasis Park is also a nice distraction from beach life and great for the kids. Another resort in Tenerife, Costa Adeje is home to sumptuous black sand beaches and imposing mountains and is the perfect place for a little seclusion away from some of the busier resorts on the island. Water sports are a big pastime here as is a trip to near the summit of Mount Teide, Spain’s highest peak.